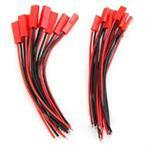 14 Gauge Silicone Wire Pkg: 10 feet Red & 10 feet Black. High-Strand-count copper wire, with Silicone insulation. 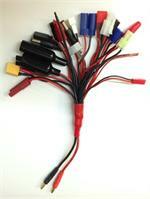 USB-6x1SMCX: USB Charger System for up to 6 x 1S LiPO batteries. Includes USB Smart Charge component and Micro USB adaptive connector. 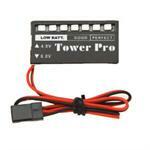 Smart-Charges up to 6 small 1S 3.7v LiPO batteries at a time. JSTWF-JSTRM: Adapter - converts JST white wing to JST red male connector. 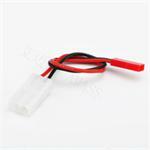 Use with small 1S LiPO batteries that have the flat white connector with lips on both sides. Converts that connector to a red JST male connector. 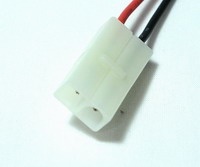 JSTWF: charging connector for 1S LiPo batteries. Includes wire leads. JST2SF-JSTRM: Charge Adapter - converts JST White 2S Balance connector to red JST male connector. Enables charging of 2S batteries thru the Balance connector for easy SERIES charging. 9-Volt connector to TAMIYA Male connector adapter. 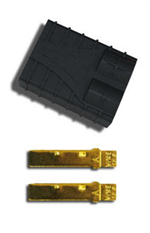 Converts batteries with TAMIYA connectors to 9V snap style; or converts batteries with 9V snap ends to Tamiya male. JSTF-JSTM : adapter extension for red JST-connected batteries. Extends your battery connector by 6". 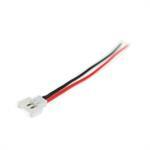 JSTF-JR : adapter for converting red JST to JR-SPEkTRUM-HiTEC-Futaba.